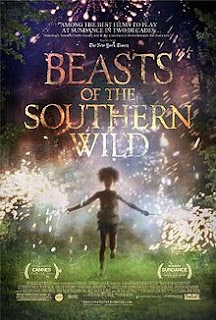 Let's start with something that can universally agreed upon: Quvenzhané Wallis, aka Hushpuppy, is a ridiculously cute child. I almost want to give her the Oscar for Best Actress just for being so cute. For one thing, her hair is amazing. I think she could give Merida a run for her money. But beyond being cute in her untamed 'fro, she completely makes the movie. Of course, she's the main character, but in movies that hinge upon a child's acting, the results can be hit or miss. For every Drew Barrymore or Dakota Fanning, there's a kid like the "human head weighs eight pounds" kid from Jerry Maguire. What makes Naysie (Wallis' nickname) successful is that she is so believable as a strong and impertinent child, which might seem easy to play since most kids are both of these things, but if it were easy to portray a normal human being, I wouldn't have to cringe every time Blake Griffin made a commercial. As for the rest of the movie... well, it's depressing. I'm pretty sure it's supposed to be inspirational or something, showing the strength and courage of a six year-old girl, but I found myself more shocked and horrified at the state in which she and her community live. This certainly isn't the first movie to show people living in a sort of back country/bayou setting, but somehow the intimacy in which the audience is drawn into their lives makes you feel all the worse that people actually live like this. That being said, I didn't find the movie particularly entertaining. Much like Amour, it was affecting in its message, but the story used to convey that message was difficult to sit through. This felt much more like a documentary with random diversions into metaphors involving extinct creatures (of which I wasn't a fan, by the way). The whole sub-plot about the melting ice caps almost felt like the writers were trying to make the script more complicated than it needed to be, to make it feel more like a "movie." Final word: I'd rather have seen National Geographic tackle this topic than Hollywood.